As much as we strive to gather around the table together for meals, there are times when our busy schedules keep us going in different directions. If it’s not busy school or work schedules, then it’s a variety of sports and other activities that keep us moving … and most likely you and your family as well! Yet, even on busiest of mornings, there’s no need to compromise on good nutrition. Thankfully, there’s always time for a quick, healthy breakfast with these delicious and fun gluten-free “grab-n-go” pancake muffins. These easy-to-make muffins are a new spin on my popular almond flour pancakes. So, they’re not only delicious, they’re chock-full of good nutrition too! That’s because they’re made with wholesome real food ingredients like blanched almond flour, which is a good source of protein and fiber. Almond flour is made by finely grinding blanched almonds, so it’s not only a naturally gluten-free, grain-free option, but it’s also very low in carbohydrates. Plus, almond flour baked goods are so light and fluffy, it’s hard to believe they’re gluten-free. Of course, my favorite part about this recipe is how easy these muffins are to make, especially in my handy KitchenAid® 12” Convection Bake Countertop Oven. 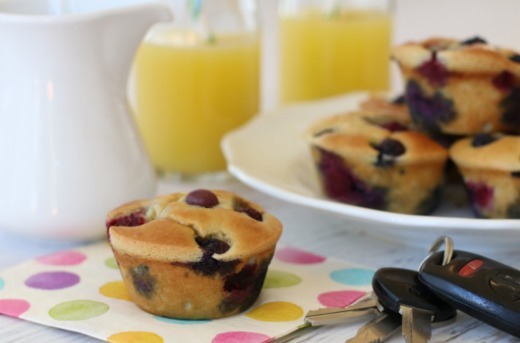 These muffins also keep beautifully in the fridge, making breakfast even quicker since they can easily be reheated in just a matter of minutes! To make these grab-n-go pancake muffins, simply blend all of the ingredients together in a KitchenAid® Blender or Food Processor, and divide the batter among a prepared KitchenAid® Nonstick 6-Cavity Muffin Pan, making sure to fill each cavity just 1/3 full. Add a few berries to each cup as shown in the photo above. Then evenly divide the remaining batter among the muffin cups and top with additional berries. Next, pop the muffins into the KitchenAid® 12” Convection Bake Countertop Oven and in less than 20 minutes, you’ve got a delicious and nutritious breakfast-on-the-go! It’s so easy to make nutritious muffins like these using the KitchenAid® 12” Convection Bake Countertop Oven. It preheats quickly and maintains an even baking temperature that makes baked goods turn out beautifully! In fact, this countertop oven is one of our favorite appliances. We literally use it everyday. It’s perfect for baking a variety of breakfast favorites, like biscuits, muffins and baked oatmeal. We also use it for reheating other favorite breakfast foods like French toast, pancakes and waffles. Of course, a good countertop oven is the perfect companion to a standard oven, giving you the ability to bake or roast multiple dishes at dinnertime as well. And during the hot months of summer, it’s especially nice to be able to bake delicious treats like these scrumptious Grab-n-Go Pancake Muffins without heating up the whole house. 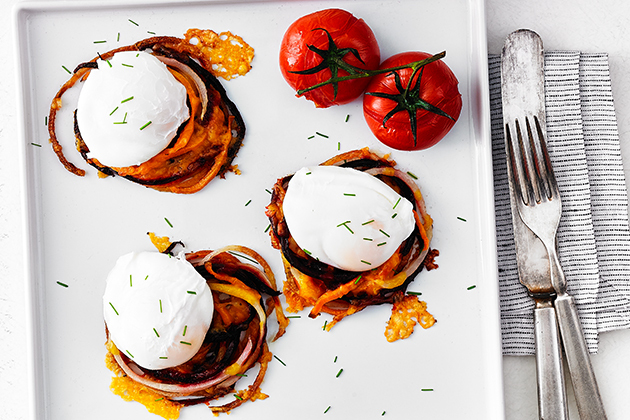 Three cheers for an easy, delicious and healthy breakfast on the run! Preheat KitchenAid® 12” Convection Bake Countertop Oven to 350°F. 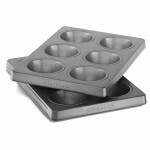 Grease a KitchenAid® Nonstick 6-Cavity Muffin Pan with butter or palm shortening; set aside. Evenly divide the batter among the prepared muffin pan, filling each cavity just 1/3 full. Add a few berries to each cup. Then evenly divide the remaining batter among the muffin cups and top with additional berries. Bake for 18-20 minutes, until slightly golden brown on top and a toothpick inserted in the middle comes out clean. Allow muffins to cool 2-3 minutes in the tin. Then run a knife around the edges of each cup and invert the muffin tin over a sheet of parchment to remove. Then grab one and go! Kitchen Tip: These pancake muffins store well in an airtight container in the fridge for 3-4 days. 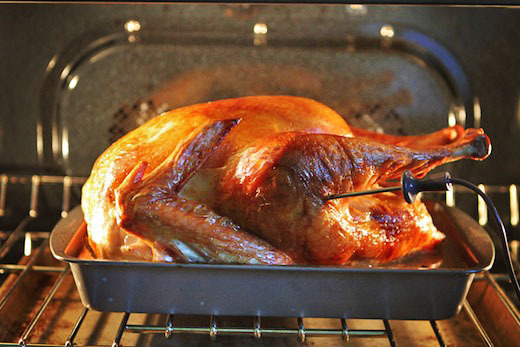 To reheat, simply place in a 200°F oven for 3-5 minutes, until warm. These look great! Love the use of low carb. almond flour. Every weekend, I see all these beautiful berries at the farmers market and now I have a perfect plan for using them. Thanks so much or sharing this recipe, Kelly. My pleasure. Thanks for taking the time to leave a kind note! Enjoy! Is there anything I can substitute for the yogurt that is non-dairy? I”ll use ghee or coconut oil in place of the butter… thanks! Hi, Kari. Yes, you can substitute any plain non-dairy yogurt you like, or simple use pure canned coconut milk (not lite) and it will work just fine. Hi, Michelle. I haven’t adjusted my fluffy coconut flour pancake recipe yet (it’s on my site). But I may give that a try as well. It should work nicely to create a delicious muffin. yummy I need more of these grab and go breakfast recipes what a great idea, thank you very much! I am going to attempt to lower the carbohydrates in these muffins with coconut flour. Is there anyway to make these egg free? I wonder if a flax egg would work? If only used as a binder then I’m sure flax will work! I will try soon and report back with results!! Update: I made using the following replacements, I used applesauce instead of the yogurt and 2 flax eggs and 1 tbsp of water to replace eggs. Used coconut oil in place of butter but I think next time I will use more applesauce, the fat from almonds makes them oily enough. I also made them mini muffins and used wild blueberries. My 6 yr old kept saying, these really taste like pancakes! Definitely a keeper of a recipe! You could also use chocolate chips instead of berries to make them more like a dessert! Thanks for sharing your egg-free substitution, Katie! Very kind of you to take the time to do that. So happy you and little one enjoyed the recipe! are the instructions the same for a regular oven? Hi, Candyce. Yes, you would bake the recipe the same amount of time in the oven as well. That’s what I love about the KitchenAid Toaster Oven, it’s very true-to-temp. Enjoy! Hi Kelly! These sound great and super convenient for the person on the go! 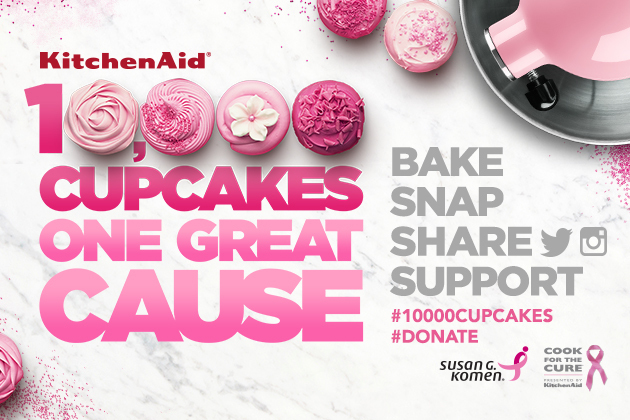 I just thought you might like to know I was thinking…maybe…since you are compensated by KitchenAid to talk about their product (as you clearly do, ad nauseum) that you might want to get the name of the product correct! You have posted, and posted, and posted your use of the KitchenAid “12” Convention Bake Countertop Oven “. I feel certain that you meant to refer to the KitchenAid “12” Convection Bake Countertop Oven”, but do correct me if I’m wrong! LOL…just getting in a bit of a jab. I really do think I’ll try this recipe. Thanks! Hi Kelly I just wanted to say that these were amazing but next time I make I wont be using a blender because ours broke when I made these but I will making them again because my 10 year old brother and dad loved them. In all seriousness, I’m glad your family enjoyed this recipe, and if you want to make them without a blender, you can always use a food processor with equally good results. Thanks for taking the time to write! Are the high altitude friendly?